Airtec’s DPG Digital Pressure Gauge is a heavy duty handheld gauge designed to accurately measure pressures up to 360 psi (25 bar). Designed specifically for use in the Aircraft industry and ground support companies for maintaining policies of checking aircraft tyre pressures after every landing. 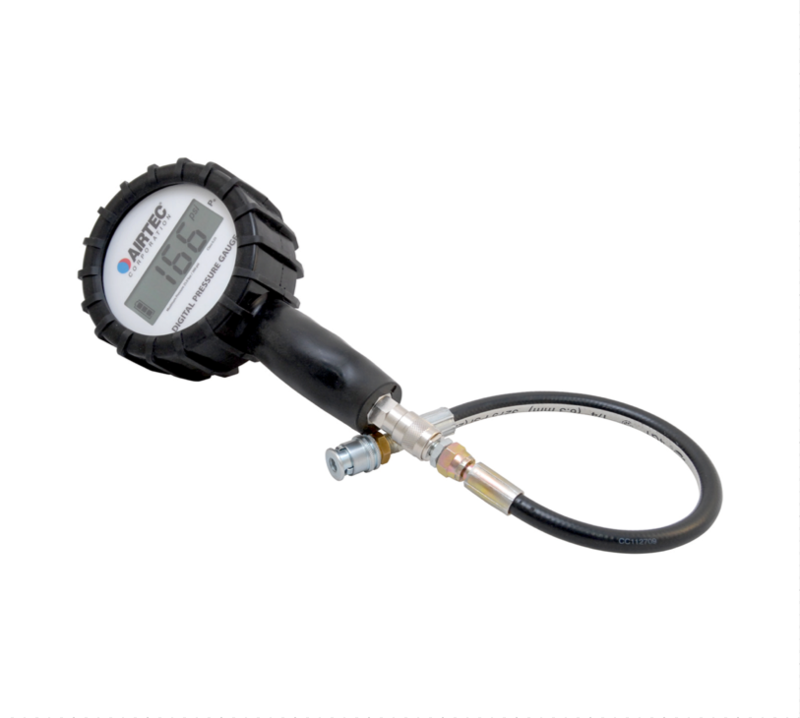 All Airtec Digital Pressure Gauges are supplied calibrated before leaving our factory. A calibration certificate can be supplied if required and is traceable to the European Standards EN837-1.The gauge is also available in a 145 psi (10 bar) version for applications in the mining, military, bulk transport and ship loading industries. Robust construction with protective rubber jacket, stainless steel housing. Large backlit LCD screen, auto power off. Supplied in a tough ABS carry case. Includes Type 4660A large bore and Type 5265 small bore lock-on hose chucks. the DPG to the valve. The actual pressure of the tyre will be displayed. When the pressure is shown the display will flash. the DPG gauge to finalise.